Amazon: Up to 60% Off Swimsuits and Cover Ups For The Family – Today Only! I like this pretty Anne Cole Women’s Twist Front Shirred Bandeau Tankini that you can pick up for only $29.00 (regularly $58.00) with FREE Super Saver Shipping! There are lots of colors available. 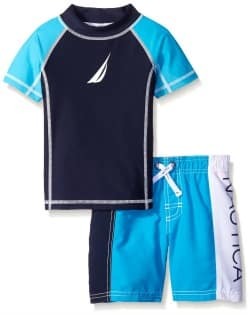 Check out this highly rated Nautica Boys’ Classic Rashguard Swim Set for just $18.90 (regularly $54.00) with FREE Super Saver Shipping! It is available in the following colors: carmine, ocean (shown) and green. Go on over to see the complete list of swimsuits and cover ups on sale today only and grab your favorites. This Amazon best bargain of the day is valid May 19 only and while supplies last.